our waterfall & wildlife tour. This eco tour will take you on a wonderful hike through the old growth rain forest on Osa Mountain. Although, flying through the canopy on a zipline is fun and exhilarating it simply doesn't give you a chance to experience the intensity of the rain forest. There really is no better way to see the incredible beauty and awe of an old growth rain forest than by walking through it with an experienced guide. Under the canopy the jungle is so alive it can literally take your breath away. You and your family may feel like you have stepped off planet earth onto another planet made up of twisting trees spiraling towards the sunlight that peeks through the canopy. A place where the leaves on some plants may grow as big as a person and insects rule the world. Your experienced guide will point things out along the trail that you would probably walk right by if you were on your own. Osa Mountain is home to many species of animals including howler monkeys, spider monkeys, 2 and 3 toed sloths, wild cats, tolomucos (a weasel like animal), pizotes (also know as a Coatimundi) and huge array of beautiful birds, butterflies and thousands of other creatures. Your walk will begin at approximately 3,100 feet elevation in the coastal cloud forest where the misty clouds actually feed many of the plants through the air and the landscape is very different from the low level rain forest. 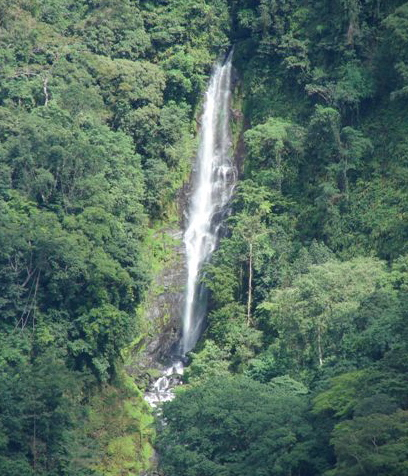 As you move down the mountain under the canopy you'll visit two incredible waterfalls. Near the end of the hike, you can even take a break and cool off if you like taking a dip in one of the swimming holes on the river. Your guide will also explain some of the interesting facts about the flora on Osa Mountain like why are orchids so different than all other plants in the forest or why the spiral staircase ginger grows in such a strange way. Get ready for a journey under the canopy of the rain forest where the jungle is more alive than anyone can describe in words and go home with pictures that will remind you the day you explored a strange new world. At the end of the hike, you can rejuvenate yourself with fresh organic fruits and juices. Adults- $25, W.I.S.E Students- $20, Children 6 to 12 years- $13.00 Not recommended for children under 6 years. Ascend through the different layers of the rainforest canopy to a height of 112 feet above the forest floor usingspecial equipment and techniques. 3 hours with guide, instructions and equipment. Limit 2 persons at one time. Tours at 8:00AM - 11:00AM and 2:00PM from Monday to Saturday. The canopy zip line tour. The tour consists of 15 platforms, 11 cables, 3 rappelling stations all designed in an eco-friendly manner that allows the trees and platforms to grow together. 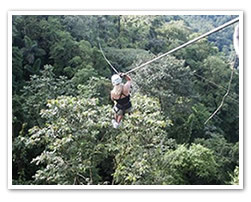 The first zip line on the tour is 450 meters long! That's almost half a kilometer and people that have taken the tour claim it is one of the best zip line tours in all of Costa Rica.. 2 - 3 hours, with 2 guides. Min. 2 persons. Limit 8 persons per tour. Tours Time: 8:00 am to 11:00 am or 1:00 pm to 4:00 pm Adults-$55, W.I.S.E. Students-$45, Children 6 to 12-$35.